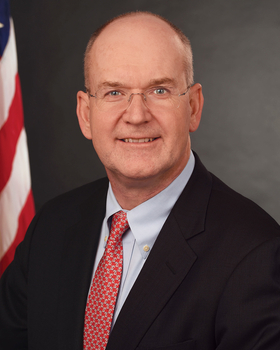 Dr. Donald Rucker heads the Office of the National Coordinator for Health Information Technology. He previously was an adjunct professor at Ohio State University's College of Medicine in the biomedical informatics department and, before that, chief medical officer for Siemens. Rucker joined the ONC a few months after passage of the 21st Century Cures Act, a far-reaching piece of legislation that calls for greater interoperability and less information-blocking. Rucker spoke with Modern Healthcare information technology reporter Rachel Z. Arndt about how the ONC is responding to the act and about giving patients more control over their health data. Modern Healthcare: What's the status of how the ONC is acting on the mandates set out in the 21st Century Cures Act? MH: Are there any timelines for delivering definitions of terms like information blocking? MH: What kind of effect will the federal budget have on those timelines? Rucker:​ The goal of the budget is to really focus ONC on some of the things that we have been talking about. Besides the ongoing certification work, a lot of this spend is going to be on Cures. The budget also reflects that a lot of the education around setting up EHRs has largely been accomplished. The meaningful-use program—which is technically done by the CMS and not ONC—is sort of already set. There is a large minority of the budget that was spent on those things. I think the budget will work on a go-forward basis, as we currently have the work scoped out. But, it is ultimately up to Congress and the HHS secretary. MH: Are there any concerns about vendor readiness for certified EHR technology? Rucker:​ Yes, I think there are. We try to understand what the vendor readiness is both for individual vendors and then for the broader community. The larger vendors tend to be more nimble in getting certified. That sort of reflects that there is a bigger market share that has access to those records. But we are still mindful. People have to A) build the software, and B) they have to test the software. They have to test different things and then, C) they have to install it. We are on a go-forward basis. There is a clear directive from the secretary to minimize some of these burdens and try to make the overall process of what government does with healthcare more efficient. MH: What's going on with the push to give consumers more control over their own data? Rucker:​ One thing that's interesting is the work on Sync for Science and some of the work in FHIR standards there and having patients be able to move their records to researchers. That's important because it is probably going to be the same technology, in part, that allows patients easy access to their records for independent apps. There is an overall goal to free up medical data at the consumer level. We want people to have access to their medical data on their smartphones in the same way that we can check if our flight is on time or check our banking or the weather or whatever your favorite sports team is. Rucker:​ Well, this is a complex technical question. You get into some fairly deep issues on authorization and authentication, because the issue is not the ID per se, as in some alphanumeric string used as an ID. It's really identifying the patient, which can be very different than an ID of the patient. Just reflect on things that are of great economic importance, like banking or your brokerage account. How do you make sure that you are the person who is buying and trading stocks? We anticipate that these technologies will all become part of healthcare. There is a complex mix of things. Some of those that I think we'll see are biometric. I personally do not believe that it is simply about having a government-issued identifier. It's worth pointing out that we already have a government-issued identifier. Most adults have at least two government-issued identifiers. How would the issues with those not go to the next government-issued identifier?